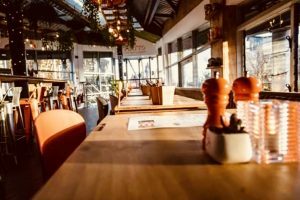 A new pasta house is in town and boy is it Fantastico! The iconic Cardiff based Giovanni family, who are behind this new offering have brought something special to the Cardiff Bay area. Giovanni Malacrino’s son, Luca Malacrino had the vision of ‘PIATTO’ and has opened this really cool new Italian pasta house. This beautiful iconic Cardiff bay building is now home to the ‘PIATTO’ restaurant and it’s looking superb. With beautiful hand crafted wooden dining tables and orange leather upholstered seating, it’s really looking funky! We were served traditional Prosecco on arrival to get us into the Italian spirits and then taken upstairs to where the main dining area is situated. The restaurant looks over the iconic wales millennium centre and graceful Cardiff bay fountains. With Giovanni’s being such an exemplary brand in Cardiff, ‘PIATTO’ had a lot to live up to and I’m pleased to say it was superb! We were given menu taster dishes and I particularly enjoyed the fillet steak pasta dish which was presented in their alluring cheese bowls, it was really delicious. The pasta was served slightly al dente and had a beautiful texture to it. The steak was expertly cooked and served medium, which was perfect. The most talked about dish of the night was their hand made cheese bowls, which was divine. Another highlight for me was their salmon stuffed squid tortellini, which was incredibly tasty and skillfully cooked. I was also really wowed by their chocolate Nutella desert offering, which consisted of a fresh pizza dough base topped with Nutella and raspberries, it was a sensational sweet finish and paired excellently with my Prosecco. 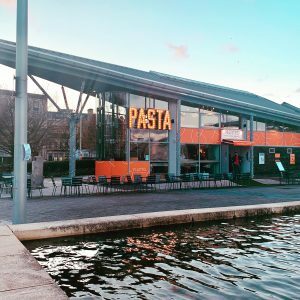 If you’re planning a trip Cardiff bay, then a visit to ‘PIATTO’ is a must! I’d like to say a huge GRAZIE to Gianluca and Giovanni for an exquisite Italian dining experience.